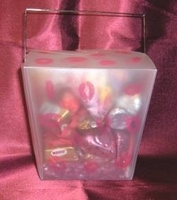 This adorable Valentine carry out box contains Hershey's Kisses, chocolate ice cubes, fudge hearts, Reeses peanut butter cups, conversation hearts, hot dog gum, buttons, red hots and of course a Valentine heart shaped sucker. This is a unique sweet treat to give to your Valentine! The perfect way to say I love you. Styles vary on these cute little Chinese carry box, either you get pink lips smacked all over the outside or a box with hearts on the outside, both with a variety of chocolate treats inside. Complete with carrying handle. Approx. size of carry out container is 4" h x 3 1/2" w.